A €440m warship has almost completely sunk to the bottom of a Norwegian fjord after smashing into an oil tanker off the coast of the Scandinavian country. KNM Helge Ingstad, a 5,290-ton frigate, was on an exercise in Hjeltefjord near Bergen when it was in collision with a Maltese-flagged oil tanker in the early hours of November 8. Eight people were injured in the crash. A large hole was also torn into the side of the vessel, which is under Nato command, according to CNN. The ship is armed with missiles, torpedoes and depth-charges. "Due to the damage to the frigate, it was moved to a safe place," Nato's Allied Maritime Command said in a statement issued after the accident. But the cables holding the wrecked vessel have now snapped, dramatically ending efforts to secure the ship. 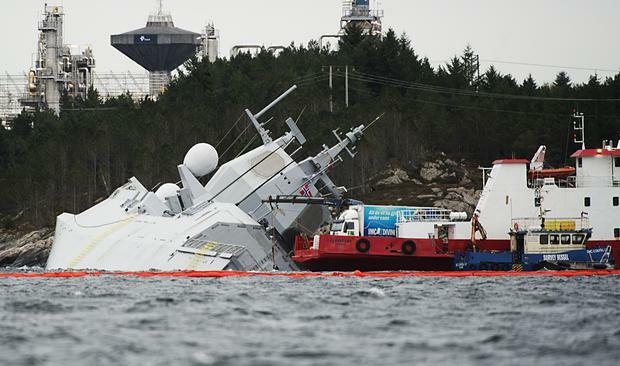 Now only the top of the vessel remains above water, in a major blow to Norway's navy. The vessel is one of only five owned by the institution, part of a class of five Fridtjof Nansen-class frigates which were launched in 2007.